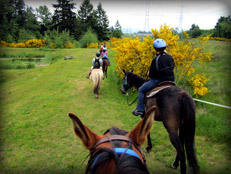 This is a great way for beginners, first time riders, riders who have not ridden in years to get some instruction and familiarity with riding, before venturing out on the trail. The min age for this is 8 years old. This is a great time for children as well as adults. 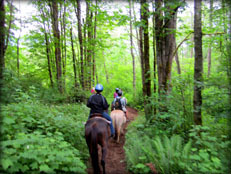 This trail ride is thru the woods and small meadow. Weight limit 250 lbs. Everyone must sign a waiver. 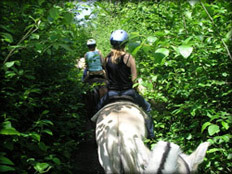 This is a great ride for those that are comfortable around a horse and have ridden before. The min age for this ride is 12 years old. This does not include a lesson. 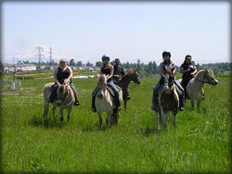 When all riders are mounted we head out for the trail. You will be given brief instruction on how to stop and steer the horse you are on. 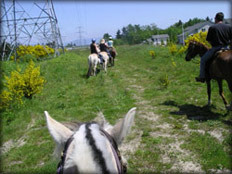 This trail goes thru the woods, meadow, grasslands, wetland over look and urban views. 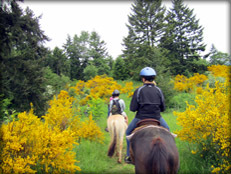 All Trail rides require a reservation made through our calendar and a non-refundable $5 booking fee. Please allow 2 hours of time for these events. They many be less or more depending upon the group. 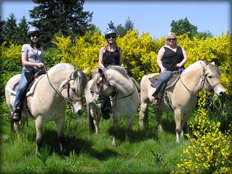 This time includes registration (filling out paperwork), helmet fitting, assigning horses, mounting, lesson and or trail ride . Please be on time or early. We like to get the group started as close to the scheduled time as possible. Please remember we do have a weight restriction 250 lbs. This is for the safety of you and our horses.